Twelve alien ships, shaped like shells, hover over different random points on Earth. Their apparent means of communication is humming, at least initially. What is their purpose? Do they mean harm, or a benign first contact? As one of the shells arrives in Montana, the U.S. Army under Colonel Weber's (Forest Whitaker) command, cordons off the area to prevent the site from becoming a tourist attraction. Two foremost civilian experts, Dr. Louise Banks (Amy Adams), a linguist, and Dr. Ian Donnelly (Jeremy Renner), a theoretical physicist, lead the contact teams. Steady but slow progress is made, but when humans misinterpret aliens' "words", some countries shut off the exchange of information, threatening a war among species. Racing against the clock, it is up to Dr. Banks to decipher the aliens' true intentions...But to convey a message that may save us all she will have to risk her life. 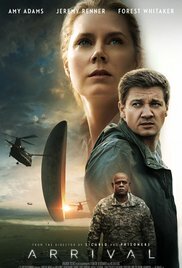 Arrival is an unconventional movie in several ways; unlike in most science-fiction movies, the “heptapods” (aliens) do not invade, and they come with a desire to communicate with humans. Also for the first time in a movie of its kind, a linguist leads a contact team, recognizing the importance of language as a means of communication. The narrative in the movie switches between linearity in the present, and flashes (in Dr. Banks' mind) of events that may or may not have happened. Little by little, we get the pieces of this puzzle until everything makes sense in the end. The humming and the foreboding musical score create an eerie atmosphere. The performances by Forest Whitaker, Jeremy Renner, and Amy Adams are outstanding—the last two having re-teamed after the much celebrated American Hustle—, but it is really the story and its meaning that make Arrival a movie so different than those of the same genre. It was considered a snub by the Hollywood Foreign Press not to nominate Amy Adams for this performance, but in my opinion, her acting was more solid in Nocturnal Animals, more deserving of a nomination for Best Actress in a Leading Role. Thanks, TRT! This was a very good movie. Happy Spring to you as well! The concept was intriguing and well executed. Let me know if you watch it what you think. I liked the communication aspects of this movie with the aliens, as well as the flashbacks. I knew there was going to be a time element to it; there often is in these space movies. All in all pretty interesting. It was. I didn't see that aspect coming, but it was a nice touch. I almost loved this movie, at least I liked it immensely. The communication thing, the fact that Adam's character had to figure out the aliens' language, and the mysterious fluid timescape, all captured my imagination. Any Adams is one of my favorite actors and I am eager to see how she does in Nocturnal Animals. Yes, all very interesting aspects that worked out in favor of this movie. I liked her better in Nocturnal Animals but most people disagree. I enjoyed this - a bit of a slow burner - but worth watching. I haven't seen Nocturnal Animals yet but I really want to. Amy Adams looks amazing in that (from what I could see in the trailer). I loved Arrival for the most part, though the ending was a bit more esoteric than I usually like. It was far better than most of the other alien movies that have come out in the last few years. I enjoyed the ending; I thought it was different. I agree with you that it was better than most alien movies in a long while, plus the "let's talk" approach was refreshing as well.